FC Barcelona’s upcoming Champions League opponents Manchester City were held to a 1-1 home draw by Everton, as they squandered two penalties in the meeting between two former blaugrana favourites. Ronald Koeman’s Everton visited the Etihad Stadium aiming to end Pep Guardiola’s immaculate home start to the campaign, while City were looking to get back to winning ways after a humbling against Tottenham Hotspur in their previous Premier League game. Possibly with one eye on his return to the Camp Nou, Guardiola made a number of changes and lined up with an unconventional system. Sergio Aguero, who played two internationals for Argentina during the recent break, was left on the bench as were several other first-teamers. For all of City's pressure, possession and slick football, Everton managed to limit them to very little significant on goal. That was until the 43rd minute, when David Silva was tripped in the penalty area, giving Kevin De Bruyne the chance to break the deadlock. However, the Belgian saw his effort saved by Maarten Stekelenburg. City absolutely dominated the game, but their ultra-attacking style always left the chance of them being exposed, and that was exactly what happened on 64 minutes. A long clearance up field from Everton found Romelu Lukaku who then shifted the ball onto his left foot and striking beyond Claudio Bravo. The hosts were given a chance to level the game through another penalty. Aguero had come on as a sub and was keen to assume responsibility despite missing a penalty in Argentina’s 1-0 defeat to Paraguay in midweek, but Stekelenburg would again deny City. 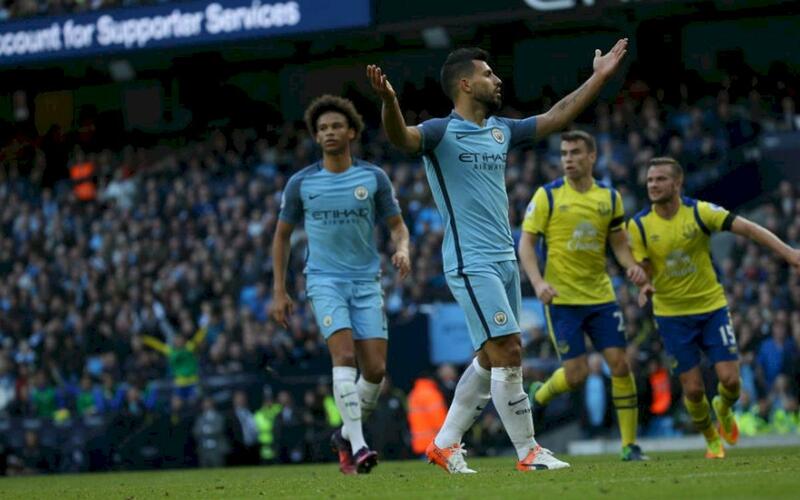 Former Barça man Nolito spared Aguero’s blushes minutes later with a well-guided header but City could not go on to find a winner in a game they dominated. It would prove an uncannily similar day of frustration for Group C rivals Borussia Mönchengladbach who also drew at home, and also missing two penalties, ending a ten-match home winning streak in the Bundesliga. Gladbach are usually so dominant at home, and when Hamburg’s Cleber was sent off on 25 minutes, they thought their afternoon would be a walk in the Borussia Park. Andre Hahn stepped up to convert from the spot but was denied by a top save from Rene Adler. After laying siege to the opposition’s goal, Lars Stindl had his chance to show Hahn how it was done from 12-yards on the hour-mark, but the German smashed his shot against the crossbar to typify their disappointing afternoon. Celtic however, had no such problem. A goal in first half from Scott Sinclair followed by a second late on, incidentally from the spot, from Moussa Dembele, secured their seventh league win out of eight to maintain their place at the top of the league.